Routing to and from the option cards is achieved via the ’Patching’ functionality on the console. Further cards are always in development and will provide various solutions for interfacing onto emerging networks or devices. The MADI I/O card can establish a 64-channel MADI input and output to a remote device such as stage rack, another console or Broadcast feed to an OB. 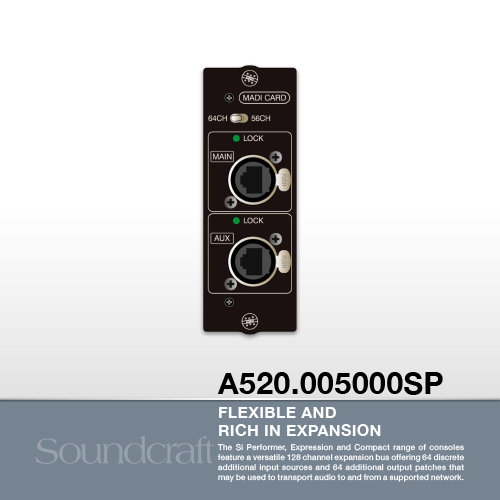 Optical inputs and outputs are provided on SC connectors and are available in single and multi-mode versions. The auxiliary interface can be used as a redundant link. A Cat5 version of the card is also available.